In a medium-sized saucepan over medium-high heat, dissolve sugar in with 1/3 cup of water; add vanilla bean, do not stir. Cook until the sugar is fully dissolved and the mixture turns into a thick syrup, about five minutes. Add blueberries, stirring for 4-5 minutes. Transfer compote to a container and let cool. Remove vanilla bean; set aside. Notes & Tips: Reserve two cold plates in the freezer to pour the hot fruit onto so it cools faster. You can make this step a day ahead of time. In a blender, blend blueberry compote until smooth. Strain thru a colander; set aside. In a medium sized bowl, whisk egg yolks; set aside. In a medium sized pot over medium-high heat, combine milk, heavy cream and sugar; bring to a boil. Temper the egg yolks with the hot mixture by adding a ladleful at a time while whisking the yolks vigorously, until all the hot liquid has been added. Using a fine mesh sieve, strain the mixture into a separate container. Chill the mixture over a bowl of ice. 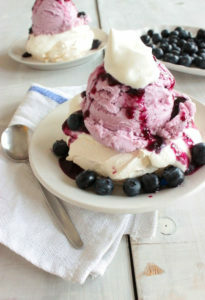 Once the ice cream base is cool, whisk in the buttermilk and blueberry purée. Notes & Tips: Have a small metal measuring cup close by to easily transfer the hot milk into the eggs. Whisk the whole time! Place the separate container over the ice before you start warming your milk- it’ll make the cooling process go faster. Be sure to cool this mixture completely before placing in your ice cream maker. This mixture can also be made and refrigerated the day before using the ice cream maker. Run the mixture in your ice cream machine following the manufacturer’s instructions. Place the finished ice cream in the freezer, and let it firm up completely, at least 4 hours. Preheat the oven to 300ºF and set two oven racks in the middle positions. Line two baking sheets with parchment paper. Notes & Tips: If you’re using a convection oven, be sure to leave the convection feature on, but lower the temp to 280 F.
In a heat resistant mixing bowl, combine the egg whites and sugar. Put one cup of water in a saucepan. In a saucepan, over medium heat, bring one cup of water to a simmer. Place the bowl with egg whites and sugar the saucepan and using a hand whisk, beat the mixture until the sugar is dissolved. In a stand up mixer, set with the wire whisk attachment, beat the egg whites mixture until it forms firm and shiny peaks. Spoon twelve large dollops of the mixture onto the prepared baking sheets (6 per sheet) and flatten them a bit with the back of a spoon so they look like a disc about 3-inches in diameter, and 1-inch thick. Make sure the meringues are at least 2 inches apart, because they will expand as they bake. Bake in the oven for 1 hour. To check if the meringues are ready, gently pull one meringue off the parchment paper – if it peels off easily take the baking sheets out of the oven. If the meringues seem to stick to the paper, leave in the oven for another 10 minutes. Let the meringues cool completely on the tray before using. In a stand up mixer of with a hand whisk, whip heavy cream with the crème fraîche until it forms soft peaks. To serve: Place six meringues on individual plates. Spoon a generous dollop of whipped cream on top of each meringue, put a large scoop of blueberry ice cream on each meringue and top with remaining compote.